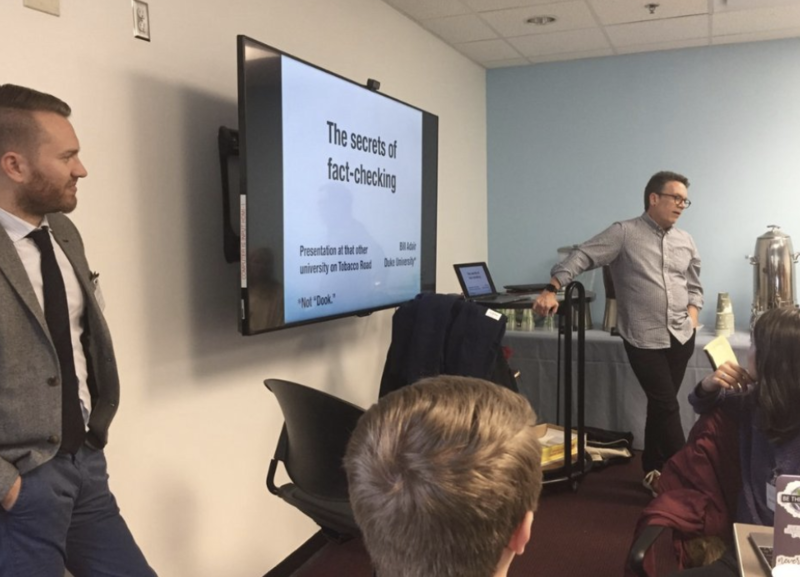 A group of students convened on the third floor of Carroll Hall last week to learn the facts of fact-checking from some of the best in the industry. “Fact-checking is its own unique art form,” said Associate Professor Ryan Thornburg, who hosted the two-hour workshop “The Secret Art of Fact Checks” featuring Bill Adair, the Pulitzer Prize winning editor of PolitiFact, Andy Specht of The News & Observer and PolitiFactNC, and Mark Stencel, co-director of the Duke Reporters’ Lab. Specht spoke about the tools of fact-checking with the group—Google, industry experts, academic reports—and the necessity of a thick skin. “You have to be prepared. People don’t like fact checks.” Specht shared several terse emails he had received from fact check recipients as proof. Stencel played a game of “Check, Uncheck” with the students as he asked them to consider different statements and whether they COULD be fact-checked at all. Ambiguous wording and opinion-filled language created difficulties often solved by using the “Jeopardy!” rule. Stencel advised students to turn a statement into a question and that would make it easier to see if it could be fact-checked. “With the democratization of digital publishing, we’ve seen that anyone can say anything. But setting the record straight requires skill and effort that only professionals are able to provide. This workshop helps give students those skills that have value in any medium—and skills that are more valuable today than they’ve ever been,” Thornburg said.